Many people know that red hair and the fair skin that usually comes with it mean a higher risk for skin cancer. What they might not know is that just being a carrier for red hair can increase risk too. Even if you don’t have red hair or particularly fair skin, you could be at a higher risk from that hidden gene lurking in your DNA. A new study has provided new evidence for why this is. 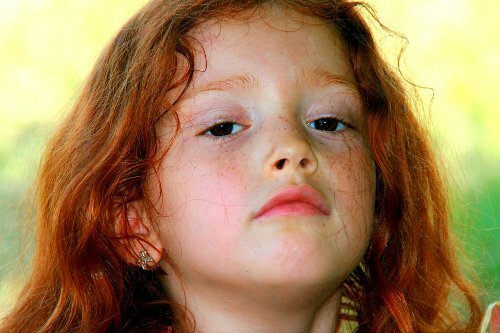 People with a version of the MC1R gene that can lead to red hair have many more mutations in their DNA compared to people who do not have those particular gene versions. So many more mutations that their DNA looks 21 years older! The results were just about the same for carriers or redheads. This finding makes a lot of sense and is a little confusing at the same time. It makes sense because cancer happens when our DNA gets damaged in the wrong place. Now a cell that has been kept under control starts growing like mad (or refusing to die). 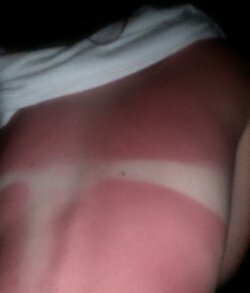 This DNA damage is a big reason why people who can’t tan are more likely to end up with skin cancer. Tanning helps protect your skin and its DNA from the sun’s harmful ultraviolet (UV) light and if you can’t tan, your DNA isn’t as protected. The more DNA damage, the higher the risk that a mutation will end up in the wrong place. The confusing bit is that the study shows that the DNA damage isn’t just because of the sun (although this is a big part). There seems to be something else about having a red hair gene that makes you more likely to end up with damaged DNA. One possibility backed up by studies in mice is that the pigment that gives red hair, pheomelanin, can cause DNA damage. Both redheads and carriers end up with a lot of this stuff in their cells meaning that if true, they’ll end up with more mutations. Another possibility is that the mutations happen because of something else MC1R does in cells. We do know the MC1R gene does more than affect skin and hair color. And we know that the red hair and fair skin happen when this gene isn’t able to do its job properly. So it could be that the increased number of mutations is due to one of its other jobs being affected as well. This study and earlier ones in mice do hint that cells with a broken MC1R gene can’t fix their DNA as well cells with only working MC1R genes. If true this would definitely mean more mutations. Our DNA gets damaged and our cells make mistakes copying it all the time. Most of these errors are fixed by the cell using a bunch of different correction tools. One site claims that without these tools our skin cells would get thousands of mutations each day just from the sun! If MC1R is important for some of this repair, then if it weren’t working properly more errors would slip through. The end result would be more mutations. But don’t walk away thinking MC1R is the most important part of repair. It isn’t. There are examples of people who have a nonworking gene that really is critical for repair. For example, people with a disease called xeroderma pigmentosum (XP) have incredibly high rates of skin cancer because their skin cells can’t deal with UV light at all. A nonworking MC1R gene is nothing like this. But it still might play a big enough role in fixing DNA that when it isn’t working, there is a buildup of mutations. An important finding in this study is that direct DNA damage from the sun isn’t the only cause of all those mutations in redheads and carriers. The researchers could tell this by looking at the kinds of mutations these people had. Our DNA consists of 4 bases that are abbreviated to A, G, C, and T. The specific order of your 6 billion of these bases are a big part of why you are different from me and why you are human and not a chimpanzee or a daisy. 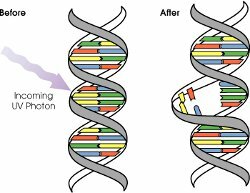 Ultraviolet (UV) light causes a very specific mistake in the DNA—it causes two T’s, two C’s or a T and a C to stick together if they are next to each other. Cells are pretty good at dealing with two T’s stuck together but struggle when there is a C.
The end results is that UV light tends to cause the C in these pairs to be turned into a T. So the researchers looked for whether or not all of the extra mutations these redheads and carriers had were C to T changes. They were not. Specifically, when they looked at over 400 different skin cancers, they found that the 194 people with either one or two copies of a poorly working MC1R gene had 42% more mutations compared to the 211 people with two working MC1R genes. The most obvious were the C to T changes but others were increased as well. In fact either 4 or 5 of the 6 possible changes were increased in carriers and redheads. So redheads and carriers of red hair are at a higher risk for skin cancer because the DNA in their skin gets beat up faster than people who have two working MC1R genes. But of course, the DNA in everyone’s skin cell is at risk no matter what is written in their genes. These folks are just at a higher risk. No matter what your MC1R gene looks like, wear your sunscreen! That will help keep those mutations (and the skin cancer that goes with it) away.